This spacious Tahoe Donner mountain retreat is in a quiet golf course neighborhood with easy winter access. Beds include 5 queen beds, 3 twin beds. On the main level are the Master Bedroom with queen log bed and a full bathroom, second bedroom with queen/twin bunk and 1 additional twin bed, sleeping loft with queen and twin beds, Great Room with vaulted ceiling, wood burning pellet stove for coziness, a game table with 4 comfortable chairs for hours of play, and a new 50' flat screen TV with Netflix and high speed Wifi. Stereo with ipod dock(bring your ipod and listen to your favorite music) and CD player, plus cable to hook up an iphone to the stereo. There is a fully equipped kitchen with everything you'll need to prepare a gourmet meal, dining table that seats 6, plus an additional 4 at the game table and bar stools at the counter. The large back deck off the Great Room has a gas grill, table and chairs with a serene backyard forest setting with stairs leading down to the backyard and lower deck. There is also a front deck off the kitchen for additional areas to enjoy the outdoors. Downstairs are two bedrooms, each with a queen bed and a full bathroom. The game room is also downstairs complete with flat screen TV with DVD player, vintage Nintenedo 64 game system with 21 games for all ages, a second TV that plays VHS movies complete with an extensive movie library for kids. Board games and direct access to lower deck and back yard area for snow play. Snow shoes and sleds in the garage. On a half acre lot with beautiful trees surrounding the cabin, great sun on the decks, and very easy winter access with a flat driveway and lots of off street parking. There is an attached 2 car garage and additional driveway parking. One street down is the Tahoe Donner Ski Hill, perfect for kids. They offer lessons for all ages and have a nice cozy lodge. further down the street is the excellent Lodge Restaurant at the Golf Course Club House, serving gourmet food in the restaurant and casual food in bar area. Great burgers for kids. Pizza on the hill is great for dine in or delivery, just a few minutes away. Trout Creek Recreation Center with full gym, heated outdoor lap pool in the winter, hot tubs, saunas and much more, perfect after a day on the slopes. There is also an awesome sledding hill next to the rec center, all just a few mintues away. There is a great little deli market down the street for coffee, newspaper and the essentials. Tahoe Donner also has an outstanding Tennis Center and Golf Course. The golf course is beautiful and very reasonably priced. The golf clubhouse lodge is new and a great place to have a refreshment after a day of golf. There is a private beach club at Donner Lake, which is 3 miles away. The beach club is perfect for all ages. For the little ones, there is a nice sandy beach area roped off for hours of sandcastle building, wading into the shallow water, or fishing for crawdads in the rocks (a huge favorite for kids, where the fun is in the catching with improvised stick poles tied with string, hot dogs make good bait!). For older kids, there is a floating platform that they have to swim to and can hang out. There is a boat launch and dock. Tons of water toys to rent as well, from canoes and kayaks to windsurfers and sailboats. Jet skiis as well. There is a great BBQ area that you can bring your own food with picnic tables, or a snack shack where you can purchase lunch, drinks and treats. The cabin rental includes 2 access cards for 4 guests each to access most amenities for $8 per person a day. These cards are also good for significant discounts at the golf course, TD Cross country and downhill and equestrian center. Major ski areas within 25 minutes include Squaw Valley, Northstar, Sugar Bowl and Alpine Meadows. The town of Truckee is a historic and charming town with unique shops, pubs and gourmet dining. We are happy to assist with suggestions! We are an active family who enjoys skiing, sailing, running, hiking and all that the mountains have to offer. We found our perfect cabin six years ago. We looked for a few years for a cabin that would have the best location, easy winter access, and plenty of room for family and friends. We also wanted a separate room for the kids to hang out with their friends. When we are not enjoying it ourselves, we share it with others who love our mountain community as we do. Cheers! We love the area, having spent many years going up and enjoying the summers and winters. Tahoe Donner just offers more than any other mountain community. Close to all the majors ski resorts, and Tahoe Donner's Ski Hill one street down from our cabin, perfect for kids to learn to ski and board. Our home provides a special place for family and friends to gather in a beautiful mountain environment. Quiet location surrounded by trees allows you to really relax while having all the comforts of home. Full kitchen with all the cooking equipment needed to prepare meals. Kids hang out room with sectional couch, flat screen TV with DVD player, and Nintendo 64 game system. 2nd TV with VHS player and several classic Disney movies. Two REI kayaks with paddles for your use. 3 decks, two upstairs off the kitchen and the family room and one downstairs off the game room. 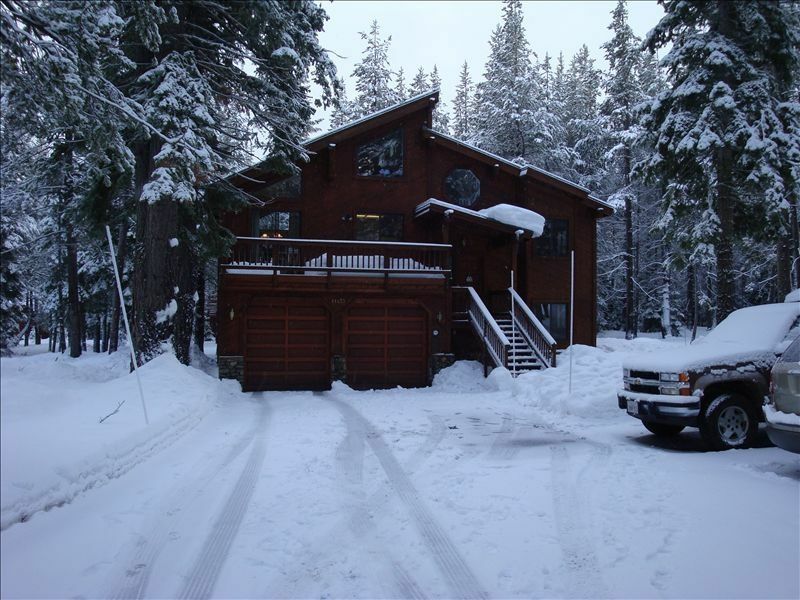 Two clubhouses in Tahoe Donner with 3 pools to choose from. We thoroughly enjoyed staying in Kelly and Gary's home for a family gathering in the snow. The beds were great, the kitchen well-equipped, and the sleds wonderful. Dealing with Kelly was a joy. She was available to answer questions and offer suggestions. We played games, some we brought and some that were supplied, and we watched the winter Olympics on the new TV. The neighborhood is quiet and very pretty. Our grandchildren loved going out and playing in the snow behind the house. Thanks for a memorable long weekend! This is our 4th year staying here during the winter, had a great time. Nice cabin, close to Truckee, which has many nice shops and restaurants. It is close to Northstar, Squaw Valley, Alpine Meadows, Donner Ski Ranch, Sugar Bowl and Royal Gorge for those who enjoy cross country skiing. A nice addition this season is Wifi & Netflix. We used to have to go to the Tahoe-Donner visitors center for Wifi, but it is so convenient to have it at the cabin. Nice & clean when we arrived, bedding & towels provided. The owner quickly answers questions and is very helpful. All holidays are $400 per night with a 3 night minimum, Christmas week is one week minimum.